Authentication is becoming a hot-button topic among researchers. For example, researchers who use cells that are meant to possess distinct characteristics have been making an issue of cell-line authentication.1 With increasing frequency, researchers who use antibodies are raising authentication concerns of their own. These researchers are insistent that antibodies be validated for function and purpose. Thermo Fisher Scientific has been working with individual researchers and the International Working Group for Antibody Validation (IWGAV) to define and implement standards for antibody testing. The company has already adopted validation standards for its Invitrogen antibody portfolio that adhere to IWGAV recommendations. Thermo Fisher Scientific uses a two-step validation approach. The first step is target specificity verification. The second step is functional application verification. Target specificity verification assures that antibodies bind to the correct target. 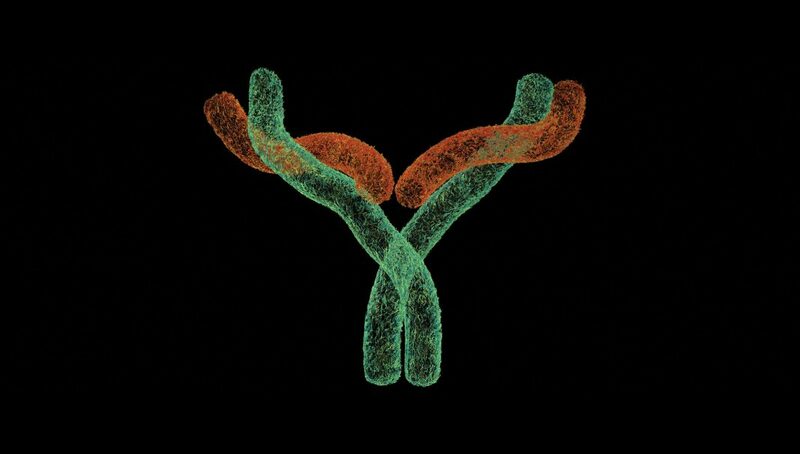 Validating an antibody’s specificity also ensures the absence of nonspecific binding. To accomplish target specificity validation, Thermo Fisher uses at least one standard method from a collection of standard methods. These methods span several categories: immunoprecipitation/mass spectrometry; genetic modification (knockout and knockdown testing); independent antibody verification (a testing approach that uses two differentially raised antibodies that recognize the same protein target); and biological verification (cell treatment, relative expression, neutralization, peptide array, and orthogonal approaches). Thermo Fisher employs several knockdown and knockout methods to test antibody performance against genetically modified samples. They include mouse knockout models, dominant negative mutants, morpholinos, short interfering RNA, and most recently, gene editing. CRISPR/Cas9 gene editing allows creation of knockout cell models for use as controls for validating antibody specificity. In independent antibody verification, antibodies should target non-overlapping epitopes on an antigen. “Obtaining comparable [affinity] results increases confidence that these antibodies are specific and suitable for the detection of their intended target,” Dr. Schrantz tells GEN.
With the orthogonal approach, the idea is to correlate two methods, an antibody-dependent method and an antibody-independent method. For example, Western blot could be correlated with quantitative RT-PCR, or flow cytometry could be correlated with Thermo Fisher’s own PrimeFlow™ RNA assay kit. Monoclonal antibodies (mAbs) are inherently heterogeneous because they are produced in living cells and can undergo unanticipated modifications during the biomanufacturing process. Living cells are capable of variability at every stage of protein expression, from the generation of amino acid chains during the formation of protein backbones, to the introduction of post-translational modifications (PTMs), some of which occur enzymatically (glycosylation), and some of which occur non-enzymatically (oxidation and deamidation). Additional modifications may occur during purification and storage. GEN readers are familiar with chromatographic and compound analytical methods, as well as the importance of using multiple, sometimes orthogonal methods, for example, size-exclusion or ion-exchange chromatography and peptide mapping. Peptide mapping followed by liquid chromatography–tandem mass spectrometry (LC–MS/MS)—the method of choice for understanding site-specific PTMs—involves serious sample preparation and lengthy chromatography runs. Researchers refer to proteolysis-based mapping as bottom-up proteomics, and those based on intact proteins as top-down methods. Peptide mapping is a multistep process generally involving antibody denaturing, reduction, and alkylation; digestion with a protease (usually trypsin); high-performance liquid chromatography (HPLC) on a octadecyl carbon chain (C18)-bonded silica column; and finally, mass spectrometry “online” with HPLC to identify the separated peptides. Together, the steps in peptide mapping take about one full day, including overnight digestion. Peptide map data analysis is complex by virtue of the sheer number of peptides generated, all of which require identification and quantitation. Analysis gets even trickier when full digestion does not occur, or when products of nonspecific digestion are present. Investigators involved in mAb characterization are therefore interested in alternatives to full peptide mapping. Many of these methods, including middle-up or middle-down, employ proteolytic enzymes that are somewhat more selective than trypsin. Among these is the immunoglobulin-degrading enzyme from Streptococcus pyrogenes (IdeS), which was first reported by Swedish researchers in 2002,2 and is now provided in commercialized in kit form by several vendors. IdeS reagents and kits are sold by Genovis, MilliporeSigma, Creative Enzymes, and Promega. “IdeS is effective due to its high cleavage specificity and simple operation,” explains Chris Hosfield, Ph.D., a senior research scientist at Promega. A related enzyme, IdeZ (from S. equi subspecies zooepidemicus), has identical specificity but cleaves mouse IgG2a more efficiently than IdeS. IdeS cleaves the IgG heavy chain below the hinge region. Post-digestion addition of a reducing agent yields a sample containing three fragments of about 25 kDa in size. This is the starting point for subsequent analysis—hence the “middle-up” designation. The approach identifies domain-specific oxidation, charge profiling, and N-glycan profiles. In a study published in MAbs,3 domain separation was achieved with a 30-minute HPLC gradient, and oxidations were quantified through ultraviolet detection. The downside is that information on modifications is not site-specific. For example, one could detect an oxidation occurring in the Fc region, but not determine definitively which methionine within that region was affected. A more recent study by a group at Genentech described an improved IdeS in which separation of the IgG domains and variants took just 10 minutes.4 Measured oxidation levels were comparable to those achieved by more complex and time-consuming peptide mapping. The level at which manufacturers validate antibodies depends on the antibodies’ intended use. An example of how validation level may complement antibody use is provided by Abbiotec, which manufactures both polyclonal antibodies (pAbs) and mAbs for research purposes. The company characterizes its products for target reactivity, but according to CEO Hervé Le Calvez, Ph.D., it doesn’t assay products for physicochemical properties, outside of purity determinations by ELISA or SDS-PAGE, which specifically test for contamination by other antibodies. “Our approach is similar between pAbs and mAbs, especially when we use peptides as antigens,” Dr. Le Calvez says. “We mainly produce GLP-grade antibodies, so we make sure screening, titering, and isotyping, if applicable, are done correctly before moving on with purification and testing.” Purification methods for pAbs vary from standard Protein A or Protein G to antigen-affinity chromatography and fractionated precipitation. In the characterization of intact, therapeutic-grade mAbs, conventional analysis tools are being deployed more systematically. As mass spectrometry (MS) becomes more user-friendly and generally accessible, mAb developers routinely adopt this method to obtain a product’s accurate molecular weight and heterogeneity (for example, with respect to PTMs). For development-stage antibody-drug conjugates, MS provides further insights into conjugation number, mAb sequence variations, and degradation products. Due to its high resolution in high mass ranges, quadrupole time-of-flight (Q-TOF) LC-MS is the mode of choice for analyzing intact proteins. Top vendors have “systematized” these instruments toward specific purposes. For example, the Agilent 6545XT AdvanceBio LC/Q-TOF system includes hardware and software features for characterization of biomolecules up to 30,000 m/z. “Q-TOFs have the flexibility to analyze not just intact proteins, but also to perform peptide sequence mapping and PTM identification and localization at the peptide level,” Dr. Wong adds. In a recent application note,5 Agilent described a typical workflow involving the Agilent 1290 Infinity II UHPLC system (at the front end of separation), the AdvanceBio LC/Q-TOF, and the company’s MassHunter BioConfirm software (for automatic data processing). The analyte was a NIST [National Institute of Standards and Technology] mAb standard. LC-MS analysis showed mass resolution of all species falling between 2,000 and 5,000 m/z. Moreover, zoom-in spectra of each charge state showed the six major glycoforms of the NIST mAb. In addition to these major features, the analysis identified minor glycosylation heterogenicities, such as loss of N-acetylglucosamine (Figure). Agilent analysis software includes a maximum entropy deconvolution algorithm, which preserves fine details of the intact protein. Typically, a mAb can have 30–70 positive charges under LC-MS conditions. Consequently, a mAb with a nominal mass close to 150,000 amu is generally detected in the range of 2,000–5,000 m/z. Figure. Major glycoforms and minor isoforms alike are clearly seen with the Agilent 6545XT AdvanceBio LC/Q-TOF system. The data was deconvoluted using the maximum entropy algorithm in the Agilent MassHunter BioConfirm software. This algorithm carefully preserves low-level peaks so that the heterogeneity of a molecules may be fully characterized. 1. A. DePalma, “Cell-Line Denial Is Too Costly, Authenticate!,” GEN 36(20), 24–27 (2016). 2. U. von Pawel-Rammingen, B.P. Johansson, and L. Björck. “IdeS, a Novel Streptococcal Cysteine Proteinase with Unique Specificity for Immunoglobulin G,” EMBO J. 21, 1607–1615 (2002). 3. Y. An, Y. Zhang, H.M. Mueller, M. Shameem, and X. Chen, “A New Tool for Monoclonal Antibody Analysis: Application of IdeS Proteolysis in IgG Domain-Specific Characterization,” MAbs 6(4), 879–893 (2014). 4. B. Zhang, J. Jeong, B. Burgess, M. Jazayri, Y. Tang, Y. Taylor Zhang, “Development of a Rapid RP-UHPLC-MS Method for Analysis of Modifications in Therapeutic Monoclonal Antibodies,” J. Chromatog. B Analyt. Technol. Biomed. Life Sci. 1032, 172–181 (2016). 5. D.L. Wong, “Precise Characterization of Intact Monoclonal Antibodies by the Agilent 6545XT AdvanceBio LC/Q-TOF,” Agilent Technologies, publication number 5991-7813EN (application note).